The first thing that crosses your mind is “am I covered for this?” That’s a great question, because if you have selected the wrong insurance, the answer could be NO. There are a lot of possibilities why you have no coverage; the most common being you attached your investment property to your Homeowner’s Policy and the property is vacant because you are rehabilitating, your homeowner’s policy may deny the claim because the property has been vacant for more than 30 or 60 days. 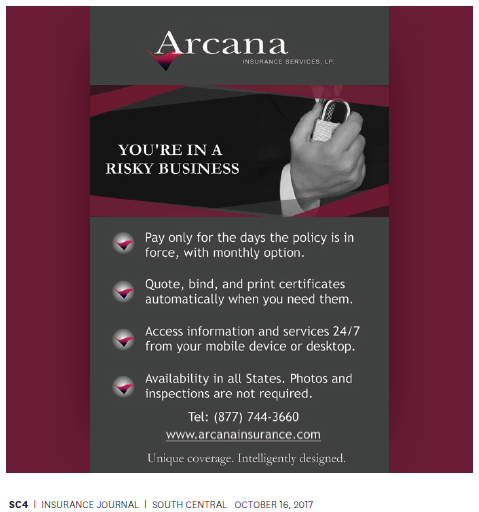 Arcana highly recommends you acquire a separate policy, be it from us or another insurance Company. Let’s assume you have made the wise decision regarding your insurance and have acquired a separate policy; hopefully with Arcana. Now you are ready to file a claim. Arcana provides two options from which to choose how best to file a claim. You may email a fillable PDF form to our Claims Department or you may go to our website and file the claim electronically. Your claim is received and set up in our claim system. You will receive a letter acknowledging receipt of your claim which will provide you with your claim number and deductible information. A local adjuster from our independent adjusting company is assigned the claim. They have three working days to contact the designated contact person you have provided. If your property has sustained damage that leaves the interior of the property exposed to the elements, you may make temporary repairs to prevent further damages. You may take some photos of the damages prior to the temporary repairs and provide those photos to the adjuster upon inspection. Be sure to present any invoices for temporary repairs to the adjuster at the time of inspection. If you have sustained water damage to the interior of the property, you may also begin the process of mitigating the water damage prior to the inspection by the adjuster to prevent further damage. Be sure to document the damages prior to these repairs as well with photos and provide them to the adjuster. If there is fire damage to the property, you will not want to begin any clean up until you are advised to do so. You should only secure the property from further entry. The adjuster will come out and inspect the damages to the property and verify the facts of loss with you or your representative. You may have your own contractor or representative at the inspection if you desire. The adjuster will complete an estimate of the damages. This estimate will be submitted to the adjuster’s supervisor for review. If the estimate appears in order, the supervisor will submit the estimate to Arcana’s Claims Department for a second review. Once the estimate has passed Arcana’s review, it will be forwarded to the insured. The insured may then review the estimate for accuracy and an agreed scope of damages. Once an agreed scope is reached, the initial payment will be requested from our accounting department. Take notice of two specific line items in the summary of your estimate. One is Recoverable Depreciation and the other is Non-recoverable Depreciation. Recoverable Depreciation is just what it says. It is the Depreciation you are entitled to recover once the repairs have been completed. To claim the Recoverable, we require the insured to submit the final repair invoice for review. Once the review is completed, a check request for the recoverable is requested from our accounting department. Nonrecoverable Depreciation is depreciation that the insured may not claim. It is utilized on items which are paid on an actual cash basis as opposed to replacement cost. There are a couple of other items related to filing a claim you should know about. If you are filing a claim for theft or vandalism, you will need to provide a police report of the incident before a claim payment can be issued. In the case of a fire claim, you will need to provide a copy of the fire report prior to any claim payments being issued. 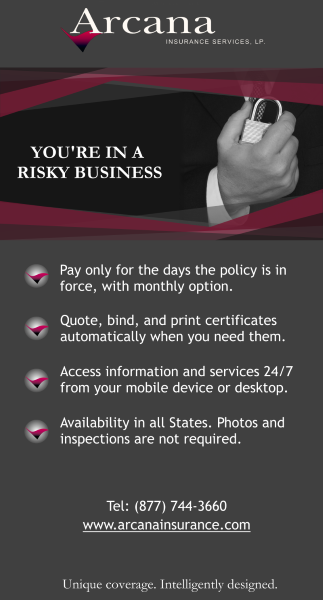 Most importantly; know what claims are covered in your Policy. Arcana is recognized nationally as one of the leaders in providing professional claim services. Please feel free to call with any questions you may have regarding your Arcana Policy. Executive Vice President and a partner at Arcana Insurance Services, LP. She is over the underwriting and claims divisions. It’s no secret, the days of purchasing single family homes for investment purposes has become extremely competitive and challenging for the average buyer. No doubt it’s a sellers’ market, especially in major metropolitan areas like Atlanta, Charlotte, Chicago, Dallas-Fort Worth, Phoenix, Portland and Seattle with values appreciating in the last 12 months 8% to 25%. Overpaying for a property typically leads to an unsuccessful ending, especially if you’re financing the property with a lender. Higher purchase prices mean lower ROI, unless the investor can collect higher rents to offset. Higher rents require higher income tenants which again is a limited resource. Plus, there is a chance the price will be too far out of the market standard and therefore, out of the Investor’s control. As the Arcana team travels around the country visiting NREIA chapters, the first question we most often hear is “What are your rates?” Not about coverage, industry experience, service standards, technology or how do you pay claims? Real estate investors in many cases are still just checking the “insurance box” when purchasing a policy. Often, we hear “I have a good deal!” which means they believe they have the best price. The next question I asked them, “Have you ever submitted a claim?” followed by “Have you read your insurance policy?” Most of the time the answer is “no” in both cases. Everyone wants a good deal, including me, but how do you define a good deal? Lower insurance rates don’t necessarily equate to lower out of- pocket expenses related to your insurance program. Payment plans, cancellation provisions and what “isn’t covered” in your insurance policy is more impactful to an Investor’s bottomline returns than merely cheap rates. Wise investors should be looking at every expense related to the purchase and financing of the asset, but as I have mentioned before in this periodical and in speaking engagements to NREIA chapters and other groups, don’t base your purchase strictly on price. cash flow to fund one’s investment and make a decent financial return for you or your investors. Under the Arcana / NREIA customized program, you truly get the best of both worlds. 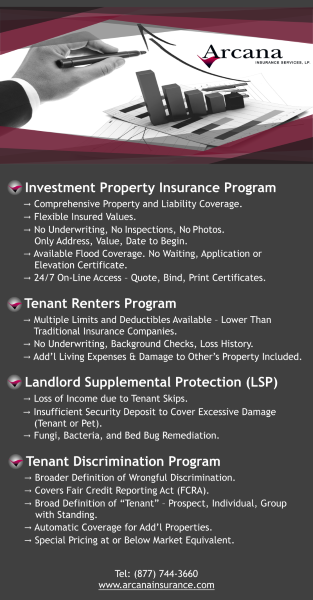 Listed below are the advantages of the Arcana’s insurance program for members of National REIA. for $365 and you sell the home on day 30 day of the insurance policy and go online and cancel your policy. The total insurance charge is $30 dollars plus applicable State surplus lines tax which is typically 5% of the earned premium. This as opposed to the other Policies where you might be facing a three-month minimum payment. No Underwriting – No photos, loss history, or inspections. Maximum Benefits – Replacement cost, All-Risk Coverage with normal exclusions, no Vacancy Clause, Occupied and Vacant rates the same. Industry-leading Technology – 24/7 ordering capability from your computer or smartphone. All accounting records at your fingertips. Dashboard platform to purchase other coverages including builder’s risk, flood, renter’s insurance, tenant discrimination and cyber liability. Great customer service and outstanding claims turnaround. I also want to bring up another point; the insurance world is no different than you when it comes to expectations on the use of its financial capital. Insurance companies are looking for a reasonable return on their investment. Arcana is a U.S. Insurance Coverholder for Lloyds of London, the largest property insurer in the United States. Less than 80 firms can claim this prestigious title. Recently our underwriters informed us that, overall, the U.S property markets have lost money the past 2 years. Fortunately for our customers, Arcana had another good year, not a great year, but better than most according to our companies underwriting divisions. The U.S domestic insurance companies have also experienced poor results. So, don’t expect the insurance market to reduce pricing any further. If you see lower pricing, be weary and cautious. Do your homework & due diligence. What you think might be a “good deal” probably isn’t. I hate using the old worn out term “you get what you pay for” especially for Arcana’s first article with National REIA, but sometimes getting a “good deal” or saving a few dollars on your insurance premiums can lead to big problems when you need it most – filing an insurance claim. Like most insureds, real estate investors are no different than anyone else — many times price points are the sole driver of decision making, not proper insurance coverage placement. Every policy you purchase should include at a minimum: replacement cost, all risk insurance coverages with normal exclusions, wind and hail coverages and liability coverages in the event of a third-party injury or someone claiming to being injured on your investment property. In today’s environment, I highly recommend a Flood quote whether the property is in a national flood zone or not. Five out of six flood losses experienced in Hurricane Harvey did not have flood insurance and many were not located in a nationally defined flood zone. One purchases insurance to have comfort in knowing when something goes amiss, and it will, the Claim will be paid within a reasonable time line at a fair value. Unfortunately, Investors are sometimes finding that an extremely low rate, quoted outside the industry norm guidelines is not always accompanied by swift and accommodating Claim payment. Do your homework and check references with your industry associates and leaders of your Association. This additional step will pay significant dividends in the long term. Another challenge in today’s real estate investment market is finding an insurance agent who understands your business and the financial exposures you as a real estate investor face. I’m amazed how many times I hear “Uncle Joe or my fraternity brother does all my insurance”. First question I ask them is “Why?”, followed with “what does Uncle Joe know about your business and the industry you’re in”? This often leads to a “deer in the headlights” look staring back at me. You must have an insurance agent experienced in this type of industry, a lack of understanding of the exposures you have as a real estate investor could be fatal to your business. Another big mistake is the assumption that a Homeowner’s policy is all one needs to cover their investment property, especially on smaller portfolios. They call their insurance agent once they purchase the property, have them add an endorsement to their Homeowner’s policy insuring their new purchase; listing the address, mortgagee, and the preferable insurance amount. Again, my first question is, “have you ever read your Homeowner’s policy?” A typical Homeowner’s Policy requires that the property is occupied. Occupied means more than just a table and chairs and a few pieces of furniture. If the property has been vacant at least 30 or 60 days, depending on the insurance company’s policy, and they prove the claim occurred when nobody was living in the property, there is a high probability they will deny the claim. How about the property being vacant while you “rehab” the building? Does your Homeowner’s or Landlord policy cover the vacancy period and the “builder’s risk exposures associated with your construction project. Many policies exclude this type of risk potential. In today’s investor environment, we are seeing more and more investors choosing to “hold” properties instead of flipping them to new buyers due to the high rental income returns being experienced in many markets. This introduces a whole new set of problems for the investor/landlord relative to their Homeowner’s coverage. 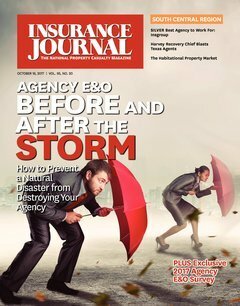 From a property risk analysis exposure, if the insurance company can prove the tenant caused the damage in question, the Homeowner’s Policy may have an Intentional Acts clause giving the insurance company reason to deny a claim. From a liability risk analysis exposure, does the Homeowner’s Policy afford you third party coverage in the event a tenant’s guest is hurt while visiting your investment property? What if your tenant has a service animal at your location, does your policy afford you coverage? With your Homeowners Policy as your insurance program for your investment properties, there is also the negative financial impact of your investment property losses impacting your own personal insurance loss history. So, choosing the wrong method of mitigating your potential financial losses whether through buying the wrong insurance policy or trusting “Uncle Joe” with his recommendations or both, has the potential to both sink your potential profits in your investment property and you having to pay more out of pocket when they raise your rates or cancel your Homeowner’s policy. In the end, the main lessons here are choose an insurance agent who knows your business and the market segment in which you are working and then purchase the correct insurance coverage. The risks you face in the future will continue to evolve and you need a knowledgeable source who will put your best interest before the mere selling of a low cost policy. Understanding your financial exposures will go a long way in saving your real estate investments and possibly your business. Arcana Insurance Services is an all-lines property and casualty managing agency that’s been working with real estate investors since it began in 2005. But long before that, founder and CEO, Mark Gannaway, served as President, Chief Marketing Officer, and Executive Vice President for several other well-known agencies and brokerages. With over 35 years of experience behind him, including 20 with Lloyd’s of London as a US Coverholder; one of only a select few in the United States. Pet Screening and Pet Damage protection – what could be better for a PM? A woman tried to kill bed bugs with alcohol — and set a fire that left 10 without a home. Three people were hospitalized and several others lost their homes after a woman accidentally started a fire inside a multifamily building while trying to kill bed bugs with alcohol, authorities said. 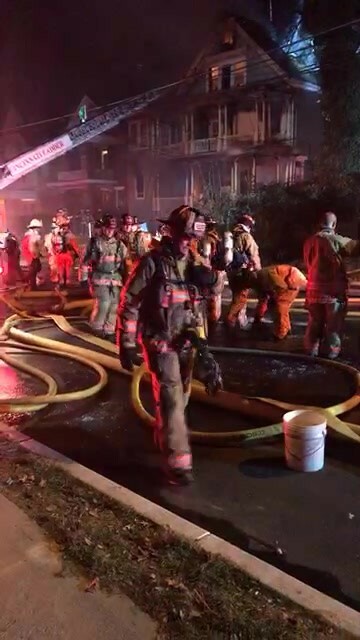 The fire broke out late Friday in Cincinnati’s Avondale neighborhood, just north of downtown. Randy Freel, district chief of the Cincinnati Fire Department, did not respond to an inquiry from The Washington Post on Sunday, but he told reporters the fire started in the first-floor unit, where the woman lives. The alcohol she was using ignited near an open flame, which was probably a candle or burning incense, the Cincinnati Enquirer reported. Three people went to a hospital for treatment for smoke inhalation, Freel told reporters. Seven adults and three teenagers were displaced by the fire. One of those displaced was Kamaron Lyshe, who rushed home after learning that his building was on fire. For the next hour, Lyshe shared what was happening through a Facebook Live video, which showed a massive fire billowing out of the building’s roof. Flames were no longer visible from the street about a half-hour into the video. Later, a visibly upset Lyshe appears to be sitting in a car and sending messages to friends. Hours later, Lyshe took pictures and videos of what was left of his building, including the third-floor unit where he lived with his family. The roof of his unit had collapsed. Its hallways and rooms were covered with ashen debris. “My room is completely destroyed, all my clothes. My closet was right here,” Lyshe can be heard saying as he briefly aims his phone at a pile of rubble. Down the hallway was his brother’s room, he said, where pieces of burned wood were piled on the bed. His brother’s closet appears to have been spared, with several pieces of clothing still intact. Authorities did not release the names of the residents, including the woman who started the fire. Fire officials told reporters that this was the second fire in two weeks caused by someone trying to kill bed bugs. A 2015 survey by the National Pest Management Association and the University of Kentucky found bed bug infestations continue at high rates in the United States, with nearly all of the respondents saying they had been treated for bed bugs in the past year. Infestations happened most often in nursing homes, office buildings, schools and day-care centers, according to the survey. Do-it-yourself defenses against bed bugs have resulted in accidental fires in the past. If you look at the Gulf Coast along Texas, in Harris County or Brazoria County, five out of six of those $100K-plus homes didn’t have flood coverage. And the reason they didn’t was that they didn’t realize the property was prone to flooding. The flood zone map said they weren’t, in many cases. An investor can have their agent pull a flood zone determination, which will cost them $7-10. They should do this every year, especially if they are in an area like Houston or Dallas-Fort Worth or an area that’s really expanding with a lot of construction because that means concrete covering up the dirt that used to absorb the water. I recommend that everybody get a quote for flood insurance, regardless of where the investment property is. It costs nothing for investors to get a quote on the premiums for flood coverage. Buy the insurance or not, but at least you know and can do a cost-benefit analysis. Investors should look at the risk and budget accordingly. After the meeting, I thought about how glad I am to have Mark Gannaway and Arcana Insurance Services on my side. Throughout my career as a real estate investor, he’s saved me time and money by giving great advice on the best ways to protect my portfolio. Having access to a team of professionals who care as much about the growth and stability of your portfolio as you do is something you just can’t put a price tag on. Arcana can be a valued member of your support team for your insurance coverage. 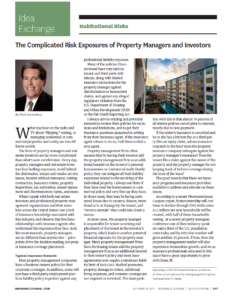 In this edition, you can find an article about The Complicated Risk Exposures of Property Managers and Investor written by our CEO – Mark Gannaway, page SC7. Also, check out our advertisement on page SC4.